In readiness for the IMO SOLAS Verified Gross Mass (VGM) requirements, which came into effect on 1 July 2016, RDS Technology offers two on-board weighing products used in the container weighing environment. Containers are being used increasingly to transport bulk products, such as grains, made possible by the use of container liners. LOADMASTER α100 is an advanced and cost-effective on-board weighing system for reach stackers operating in the toughest port environments. With the focus on container weighing, LOADMASTER α100 has been designed to operate within the fastest loading environments and restricted loading areas, reducing cycle times and maximizing containers weighed per hour. The LOADMASTER 100 uses a 7” colour-resistive touch-screen display, providing a modern and ergonomic operator interface. The system continually measures hydraulic pressure using up to four sensors. The pressure signals are captured and filtered through a weighing ‘arc’ provided by inclination sensors measuring the angle of the main boom. All signals are processed in the RDS Smart Box and the resultant weight calculation is sent to the terminal mounted in the cabin. The SQL database capability with up to eight reference fields is designed to provide virtually unlimited inputs of containers, customers, trucks, hauliers, locations, destinations and notes. Video input for switching head unit into reversing camera mode removes the need for additional screen, releasing valuable cab space. iSOSYNC software can be used with LOADMASTER α100, designed to allow the rapid transfer of job information from a central computer to the reach stacker. The resultant load information is sent back to the PC upon completion. 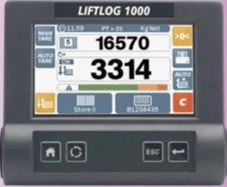 With the ever increasing focus on safe loading of containers, the new LIFTLOG 1000 is a cost-effective weighing instrument designed for forklifts working in a dispatch port environment. Weighing on the forklift removes the need to travel to a static floor scale, often remotely located from the stock location or loading bay. The LIFTLOG 1000 informs the operator of the load as a ‘calculated’ weight in tonnes, kg, lbs and US tons. This load can then be confirmed automatically or via the ‘Enter’ button and added to the accumulated total. It will also be added to the grand total. In addition, when approaching and at the point of overload, an internal (and optional external) alarm will sound to further inform the operator of load status. Approximate load is indicated via an on-screen Load bar. The LIFTLOG 1000 uses a 4.3” colour, hi-brightness-resistive touch-screen display and additional physical keys, providing a modern and ergonomic interface. A stores function saves load/ lift totals against a total of 100 named memory stores, consisting of up to 1,400 lifts, which can be given an independent ID reference. Communication is provided via SD card and USB, designed to allow safe and efficient handling of stored data to-and-from office or added external data storage. Two serial outputs support the ICP 300 printer option or communication to PC using .csv or .xml file format. RDS Technology, a Topcon Positioning Group company, supplies over 100 original equipment manufacturers worldwide with custom solutions, as well as supplying standard ‘retro-fit’ products through a network of specialist independent distributors in over 30 countries where customer service is the highest priority. Headquartered in Minchinhampton in the United Kingdom, RDS pioneered the use of electronics for agriculture and continues to lead in other sectors of mobile machinery.